A serious automobile accident can be detrimental for all those involved. Though most people like to think that they’re able to avoid these accidents, it should be noted that the average driver will still have to file an auto insurance claim once every 17.9 years. Though factors of insurance providers and who’s at fault can be difficult to understand, this complexity is amplified when multiple vehicles are involved in a crash. This is why all drivers should understand what they’re facing in these situations. The first thing to do after a multi-vehicle accident is to call emergency personnel. If it’s safe to do so, it is also helpful to check and see if anyone is injured. This will help first responders react accordingly. Even if there are no injuries, police should still be contacted. This isn’t a simple case of one car being involved in a fender bender with another where the two drivers decide to go about their ways; the complexities of negligence involved with numerous drivers makes it essential to have a police report on file. This police report will prove to be an essential document when you consult with Harshbarger Law or another law firm from your local community. It’s likely that police will want to interview all drivers in the accident. This can, of course, be difficult due to the varying outcomes that different drivers may face. 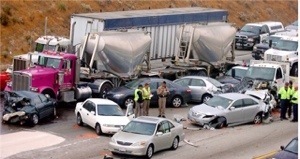 In a recent 10-car pileup in California, for instance, seven individuals had to be taken to the hospital. This means a bit of traveling for sheriff’s deputies, but it’s essential if a driver hopes to receive compensation for their medical bills and property damage. In single car crashes, assigning fault isn’t often a difficult task. However, when multiple vehicles are involved this fact goes out the window. It is still easy to attribute negligence in some instances, though. If a speeding car runs a stop light, t-bones a passing vehicle and that passing vehicle slides into oncoming traffic, then the driver who ran the red light is responsible for all damage and injuries. Had their negligent actions not have taken place that day, it’s likely that everyone would’ve gotten to where they were going without incident. In rear-end collisions, however, the negligence atmosphere can be more difficult. If a car slams on brakes, gets rear-ended by a second car and that second car gets rear-ended by a third, the only at-fault drivers will be the second and third car. Each will likely be charged with following too closely. Since these accidents and most state rules are so in depth, it usually benefits a person to seek out legal help. There are various difficulties that can arise from multi-vehicle accidents. In states that practice contributory negligence laws, for example, an accident victim may be unable to recover anything if they were negligent in even the smallest of ways. For instance, if a person was changing lanes in the middle of an intersection, an illegal act in many states, and is struck by a car that didn’t have the right of way, neither driver may be able to recover compensation due to their dual negligence. In addition, the time may come when a negligent driver’s insurance won’t cover damages and injuries. States have certain auto insurance coverage minimums that people must purchase. Once the amount of coverage they purchase is exceeded, the insurer isn’t liable for any further damages. It’s easy to understand how these minimums can easily be passed in multi-vehicle situations. Multi-vehicle accidents can be confusing for anyone to understand. Rules of negligence, which aren’t easy for the average person to comprehend, can quickly become convoluted in the aftermath. Luckily, legal professionals are often able to quickly ascertain who it was, even if multiple people were at fault that caused the pileup. This makes taking the right steps and speaking to the right legal professionals essential after any multi-vehicle accident. When involved in any type of accident that causes bodily injury, it’s best to consult legal professionals. Contact Harshbarger Law and we can help you prepare a path for gaining the compensation you deserve. This entry was posted in Personal Injury and tagged Accident, auto insurance, collission, confidence, fender bender, negligence, rights, safety, security. Bookmark the permalink.